Fooditka: Honey Salmon Inspired by "Feed Your Roots"
Honey Salmon Inspired by "Feed Your Roots"
Last week I mentioned a recipe of mine that Penina from Feed Your Roots made and reinvented. This time, I tried one of her recipes and changed it around as well. Penina calls it "the make everyone happy meal," and I agree. It's easy, fast, healthy and uses common ingredients that are probably already in your pantry. Instead of chicken, I incorporated a nice, fresh salmon fillet (no frozen stuff). I also substituted the quinoa side dish for rice and peas - it provided a nice starch and veggies, adding nutrients. I poured some extra marinade on top of the rice to make it more flavorful and voila, a tasty dinner was born. Preheat oven to 350 degrees. Mix all ingredients together. Lay chicken, fish or other protein in pan. Pour sauce over the protein, making sure each piece is well coated (the chicken/fish/tofu should sit comfortably in the sauce, but not be too saturated). Cook for a 1 – 1.5 hours (for chicken) or about 30 minutes for fish and tofu depending on thickness – flip the chicken and tofu halfway through to make sure both sides are evenly cooked. While the fish is cooking, make a cup of white or brown rice. After it's cooked, add a 1/2 cup of frozen (but thawed) peas. Place rice and peas on a plate as the bed for the fish. 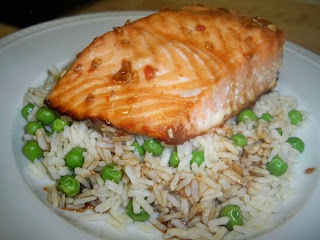 Put the baked fish over the rice and top with more soy/honey glaze. When you say "Mix all ingredients together" that implies to mix the rice and peas and cook with the fish. You may wanna be a bit more specific. I'll let the author of this recipe know about your suggestion. Thanks.